Torrevieja & surrounding areas - The bustling coastal town of Torrevieja sits between Alicante in the North and Cartagena in the South on the Costa Blanca. Located just 47kms from Alicante International Airport and 35 kms from San Javier International airport in Murcia. An old fishing town with it's own harbour and fishing fleet is busy all year round. You will find lots of shops, great restaurants, a large selection of bars and nightlife. Wander along the beautiful new Promenade of Torrevieja and enjoy the atmosphere of the evening craft market or sit at one of the pavement cafes and watch the world go by. All of the Valencian coast beaches are controlled by the EC which sets quality levels for the swimming areas. The most prestigious award is the European Clean Water Blue Flag, which means that the beach has achieved an optimum level for swimming and recreational activities. The Valencian coastline has 94 blue flag beaches, several of which are in Torrevieja, such as Los Locos beach, El Cura beach, Los Naufragos beach and the Royal Nautical Club. The Friday market is one of the largest in Europe and you will find everything here from genuine Spanish handicrafts, to low priced leather goods, shoes, textiles, silver and a variety of fresh local produce. 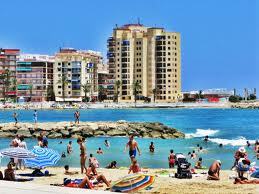 You won't find any package holidays to Torrevieja as all the properties are privately owned. Torrevieja is full of history, from the Roman pier at La Mata to wonderful churches. The Archipriestal Church of the beginning of this century where the image of the Immaculate Conception the town's patron saint is worshipped. It is surrounded by the famous salt lagoons which makes it one of the healthiest climates in the world with over 300 days of sunshine. The salt lakes are rich in minerals and with the dry air reducing humidity produces a healthy atmosphere which is excellent for arthritis sufferers. Torrevieja is the sports enthusiast's dream come true. It offers sailing, diving, tennis, bowls, athletics, football and a gymnasium. With several Championship golf courses, it is an ideal place to relax and enjoy a golfing holiday. A total of 54 holes, covering an area of 1,700,000 sq.m. give shape to the Villamartin, Las Ramblas and Campoamor golf courses. You can take a boat ride to the island of Tabarca where you can scuba dive or sail along the coast. You can take a fishing trip and boat rides which are available from the port of Torrevieja.